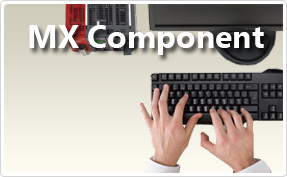 MX Component is the Active X® control/.NET control library enabling communication from a PC to a programmable controller and motion controller regardless of communication protocol. Complicated programs for serial and Ethernet communication can be developed with simple steps. The Wizard style communication configuration utility facilitates access to the programmable controller's CPU. The communication configuration utilities saves the set programmable controller CPU's logic station number, making it simple to access the programmable controller's CPU just by setting the station number. Real time graph display applications can be created using VBA programming in Excel® and Access®. Logged programmable controller device data can be collected and saved in real-time. Devices can be set according to the assigned label. Labels enable intuitive configuration of the program within MX Sheet or directly in the program itself. Therefore, if changes are made to the devices, there is no need to further change the program or MX Sheet file.